Link PNG, a subsidiary company of Air Niugini welcomed an additional DHC-8-315 fifty seat aircraft, P2-ANP, which arrived in Port Moresby last Friday (27th April, 2018). General Manager, Mr Bruce Alabaster said the recently acquired aircraft now brings the total aircraft in Link PNG fleet to eight Dash 8 aircraft, comprising five Dash-8-315’s with 50 seats and three Dash-8-202’s with 36 seats. Mr Alabaster said the new aircraft is fitted with long range fuel tanks and would assist with flights over some of the longer sectors especially over the next 24 months as National Airports Corporation conducts runway upgrade works at many airports as part of the CADIP program. The arrival of the latest aircraft now brings the number of aircraft in the fleet with this benefit to three aircraft. Link PNG currently operates scheduled flights to fourteen airports in the country. Established on 01st November 2014, Link PNG provides regular, reliable, safe and affordable services especially to the more remote parts of Papua New Guinea where patronage is less than the main domestic routes, but just as important for the travelling public. 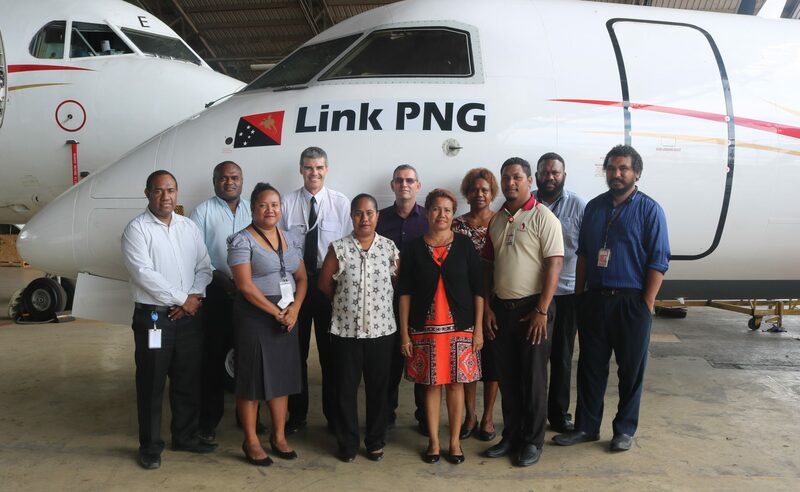 Link PNG ensures that not only are remote and less profitable services maintained, but is working to expand the network to additional airports to meet the growing transport needs of Papua New Guinea and our people.